Ryan Reynolds posted an image of his mother with him on a red carpet, but something is a bit off with the picture. Closer inspection notices that Deadpool 2 star Reynolds Photoshopped Deadpool tattoos all over her face and chest to promote the free tattoo event at Brazil Comic-Con. According to the Merc with a Mouth, fans who attended Brazil Comic-Con were able to get themselves a free Deadpool-themed tattoo by artists who were "moderately trained," while offering those fans four different designs to choose from. Deadpool even talked about the different designs being offered and mentioned a family-style tattoo that may or may not have had something to do with a mom. Ryan Reynolds took to Instagram to share the picture of his mom with her new Deadpool-themed ink and said, "My Mom had the best time in the Deadpool tattoo booth at Brazil Comic-Con." Reynolds is no stranger to having fun with his family members on social media. A quick search through his posts reveal that he pokes fun at his wife, Blake Lively, quite often, posting unflattering pictures of her out and about without makeup on or just cropping her out of the photo completely. His 15.9 million followers love each post that he puts up, but these new Deadpool 2 promotional posts are starting to go viral. Deadpool 2 recently wrapped up principal photography and is now in the post-production stages. A real trailer shouldn't be too far off, but Ryan Reynolds has been teasing out little unorthodox promos for the upcoming sequel. Hardly any of the teasers have contained any footage from Deadpool 2. Instead, Wade Wilson has appeared on a special edition of Good Housekeeping in time for the holidays as well as the new Brazil tattoo idea. The tiny bit of footage was shown off as a Bob Ross spoof and now he's showing his mom with some Deadpool face ink. The first Deadpool movie was a surprise hit, and it starred Ryan Reynolds as the hideously disfigured, super powered "Merc with a Mouth." Reynolds is a longtime fan of the Marvel comics antihero Deadpool, and the role seems tailor-made made for him. But the stuff that the character is known for may be getting a censor if the Disney/Fox merger goes through, which is looking more likely by the day. Kidding aside, Deadpool will get left alone if the merger happens, but Disney will be fair game to be put in Wade Wilson's crosshairs. The first trailer for Deadpool 2 likely won't hit until the new year, but thanks to the huge success of the first one, this is one of the most highly anticipated movies of 2018. Josh Brolin's Cable, Ryan Reynolds's Deadpool, and Domino played by Zazie Beetz will help set up the recently announced X-Force movie as well, which may come out under a Disney affiliate. 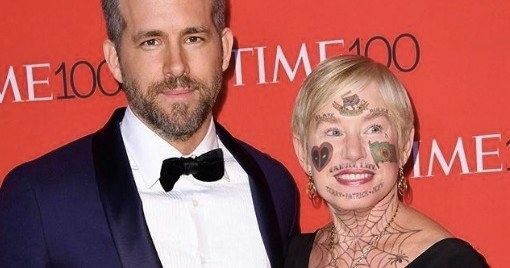 You can check out a tattooed mother on the red carpet after Brazil Comic-Con below, courtesy of Ryan Reynolds' Instagram account.